2) Port Alberni Stay on Highway #4/Johnson Road through downtown Port Alberni until you get to the rivers edge and Boat Basin area. 3) Port Alberni Turn Off Turn right on the River Rd/Victoria Quay juncture and then follow the Sunset Island Resort Logging Road Directions provided below. 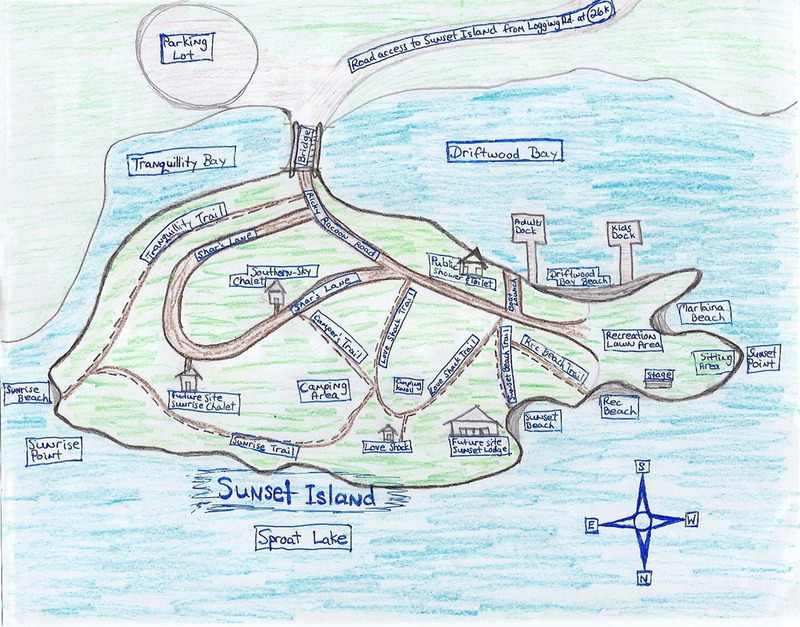 4) Sunset Island Resort Logging Road Map Be sure to set your odometer at the Arlington Beer & Wine store located at the River Rd./Victoria Quay juncture. 5) Sunset Island Resort roads and trails You are welcome to drive across the bridge right on to Sunset Island to unload your supplies at your awaiting accommodations. Once you have unloaded, please do not remain parked on the island for any length of time. There is designated parking in the parking lot just across the bridge - a 2 min. walk. Chartering a Sea Plane can be easier than you think. Depending on the number of guests in your party it can actually be quite cost effective. Please click on the appropriate link below for more information on flying from your area. While speaking with the charter booking agent, you may want to give them our website address and/or phone number so that we may assist them with directions and landing instructions for Sunset Island Resort: www.sunsetresortsproatlake.com, 250-713-7366. Please note that when chartering a Seaplane, the allowable baggage may be limited depending on how many people are flying with you. In this event, you may want to use the Grocery Delivery option and/or Catering option. Please check on-line or use yellow pages to find services in the Port Alberni, BC area. Your food and/or dinning requirements will be conveniently delivered to your Chalet door. Arranging a shuttle service with Kenmore Air, or a short cab ride from Seattle airport (approx 1/2 hour) to Kenmore, Lake Washington is required. There is a private boat launch right on Sunset Island Resort. You can drive your boat right on the Island and launch it there. Follow the logging road directions map in the "Getting Here" "By Land" section. Even though this is a well maintained logging road, during some seasons, you may have to go slower than usual. If you would prefer, you can launch your boat at the Public Boat Launch and cruise out on the lake to Sunset Island Resort. The Public Boat Launch is located just off the Pacific Rim Highway a few miles past the McCoy Lake turn off. 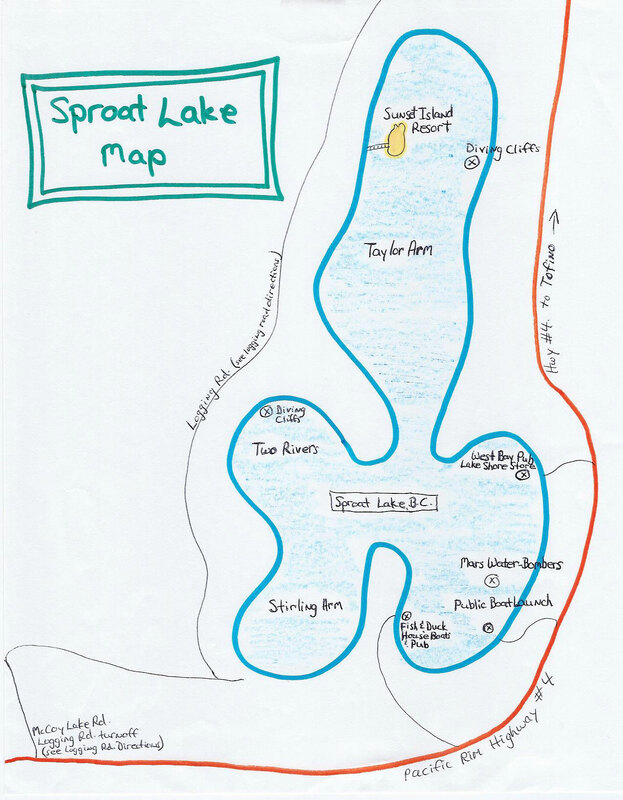 See "Map - Sproat Lake areas of interest". Parking rules in this area are unknown at this time, please call us at Sunset Island Resort 250-713-7366 so that we may assist you with additional information. As a suggestion, a member in your party may decide to drive your vehicle to Sunset Island Resort via the logging road after the boat is launched in this area, while others arrive via boat transportation.